Range: Native to tropical West Africa, including Gambia, Senegal and Camaroon. Aziza came to Turtle Bay as a youngster to live in the parrot playhouse. Aziza means “precious one” in Swahili. 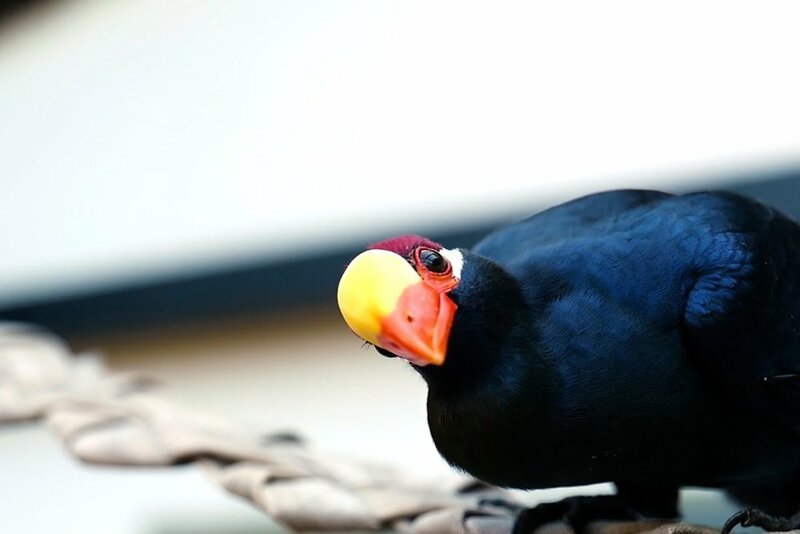 Turacos are in the same order as cuckoos and road runners. Turacos are the only bird with truly green pigment. Other birds appear green, but are not actually green. In turacos, the copper in their feathers creates a pigment called turacoverdin that is actually green. Another pigment, turacin, creates the red in the feathers. When immersed in water for 2-3 days, a red feather will leach the pigment and turn the water pink. The feet on a turaco are semi-zygodactylus, meaning the outer toe can rotate forward or backward, either to run across the branches or to grip.